A light ray from the SOLID YELLOW object strikes a vertical mirror at point O, and the reflected ray enters the eye thus allowing the person to see the solid yellow object inside the mirror shown as dotted lines. 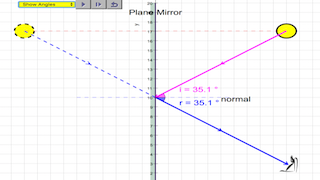 By projecting an imaginary normal line through point O perpendicular to the mirror, known as the normal, we can measure the angle of incidence, θi and the angle of reflection, θr. The law of reflection states that θi = θr, or in other words, the angle of incidence equals the angle of reflection. The dotted light rays shows the imaginary lines that the image appears to come from assuming light travels in a straight line path. The arrow head direction serves to symbolize the direction of light travelling. point object with simple ray, to multiple rays entering the eye. principle in constructions, measurements and calculations.